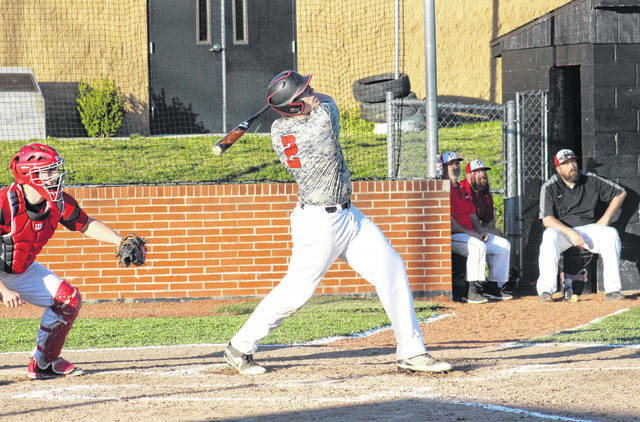 Point Pleasant senior Brody Jeffers (2) follows through on his grand slam home run, during the Big Blacks’ 17-2 victory on Tuesday in Point Pleasant, W.Va.
POINT PLEASANT, W.Va. — A super second inning. 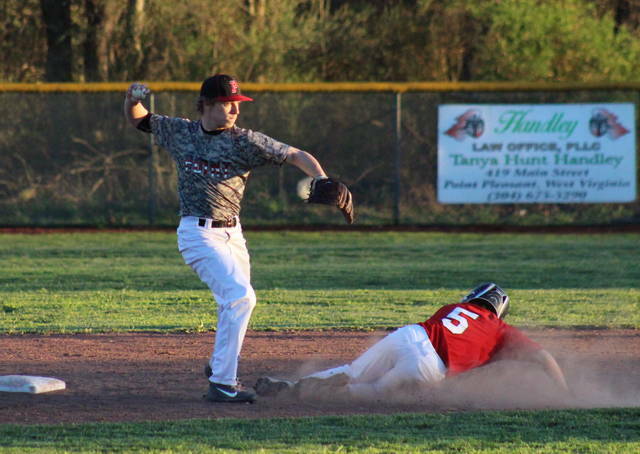 The Point Pleasant baseball team batted around twice in the second frame of Tuesday’s non-conference game in Mason County, as the host Big Blacks rolled to a 17-2 mercy rule victory over Ravenswood. Point Pleasant (11-3) broke the scoreless tie in the bottom of the first, as Miles Williams scored on a Hunter Blain grounder, the second out of the frame. The next five Big Blacks were either walked or hit by a pitch, bringing two more runs home for a 3-0 lead. The first four PPHS batters in the second inning drew walks, bringing home one run and loading the bases for Brody Jeffers. The Point Pleasant senior first baseman delivered in grand style, blasting a home run over the right-center field fence to set the tone for the 13-run inning. Point Pleasant couldn’t add to its 16-0 lead in the third, but went ahead 17-0 in the bottom of the fourth, as Christian Holland scored on an error. Ravenswood ended the shut out with a two-run, two-out double by Kenley Hickman in the top of the fifth, but couldn’t avoid the 17-2 mercy rule setback. 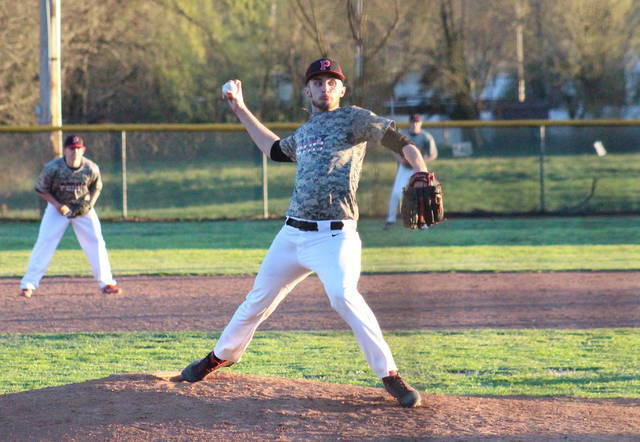 Levi Mitchell was the winning pitcher of record in a complete game for PPHS, striking out seven batters and walking two, while allowing two unearned runs on a pair of hits. Sam Strum took the setback in an inning of work for Ravenswood, allowing five earned runs on one hit and six walks. Jacob Hatcher, Benjamin Queen, Hayden Swain, Blake Bell and Jacob Adkins finished the game in relief for the Red Devils, allowing a combined 12 runs, nine earned, on nine hits and seven walks. Swain and Adkins each earned a strikeout for the guests. Leading the PPHS offense, Williams was 2-for-3 with a trio of runs scored, and Tanner Mitchell was 2-for-2 with three runs batted in. In addition to his grand slam home run, Jeffers scored two more times and drove in another run. Wyatt Wilson tripled once, scored once and drove in one run for PPHS, while Holland doubled once and scored once. Blain, Levi Mitchell and Riley Oliver each singled once in the win, with Blain scoring twice and driving in two runs, Mitchell earning an RBI, and Oliver scoring a run. Joel Beattie and Carter Smith both scored twice, with Beattie earning an RBI. 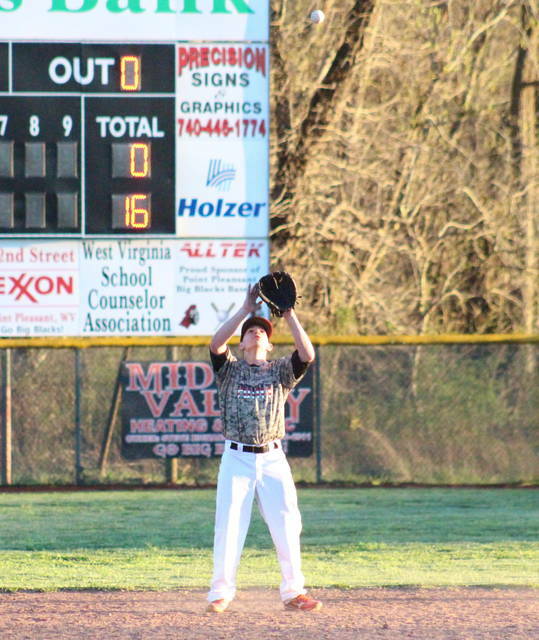 Sam Pinkerton contributed a run and an RBI to the winning cause, Kyelar Morrow added a run, while Cason Payne and Colten Fridley chipped in with an RBI apiece. Clah Kennedy led Ravenswood’s offense, going 2-for-3 with a run scored. Hickman doubled once and drove in two runs, Swain added a single, while Caleb Lawrence scored a run. Point Pleasant committed two errors and left nine runners on base, while Ravenswood had three errors and six runners stranded. Next, the Big Blacks have another Jackson County opponent, as the visit Ripley on Thursday.